At AluminumChristmasTrees.net, we provide an opportunity to shop for original, vintage Aluminum Christmas Trees and accessories. Here you will find classic, original aluminum Christmas trees, color wheels, and rotating tree turner stands from the Space Age. You will see trees from such companies as Evergleam, Revlis, Warren, Silver Pine, and Krystal, and color wheels and tree turners from such companies as Spartus, Penetray and Holly Time. You may find these items for sale in our store. Introduced to the market in 1959 by the Aluminum Specialty Company of Manitowoc, Wisconsin, the aluminum Christmas tree soon became a staple in people's homes at Christmastime. 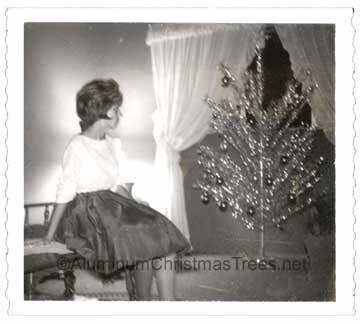 Aluminum trees had a unique, "modern" look that appealed to consumers during the Space Age, they easy to set up and take down and they did not require the stringing of lights, due to the potential of electrical shock. Instead, lighting was provided separately by a rotating color wheel - a spotlight with three or four colored lenses that changed the apparent color of the tree as the lens rotated in front of the light. The initial success of these trees in the marketplace encouraged other manufacturers to make them, as well. Soon, several dozen companies offered all sorts of aluminum Christmas trees for sale - tabletop versions, wall mounted versions, and free-standing versions in four foot, five foot, six foot, seven foot and even eight foot sizes. Some had as few as two dozen branches; others had as many as two hundred and fifty! 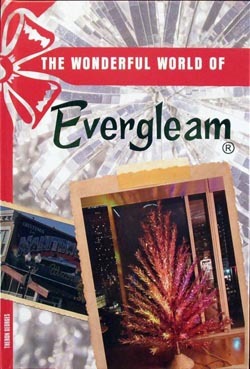 Not content to offer just silver-colored trees, manufacturers soon offered colored aluminum trees as well - green, blue, red, gold and even pink ones. The silver tree reigned supreme, however, and aluminum Christmas trees in colors other than silver are quite hard to find today. The pink ones are particularly rare; we would estimate that only one out of every 10,000 aluminum trees made were pink in color. Color wheels also came in several varieties, with plastic cases, metal cases, glass wheels, plastic wheels and even combination color wheel/stand units. While most were intended to be mounted on the floor, some could be mounted on the wall, as well. An additional accessory came along - the rotating tree stand. These motorized stands would allow the tree to rotate, typically once every one to two minutes. The sight of an aluminum Christmas tree, changing in colors every few seconds and rotating at the same time is quite a sight! "Why buy Christmas trees out of season? ", you may ask. Quite simply, the laws of supply and demand make trees more affordable out of season than they are during the holiday season. It's also a much less stressful time to buy.